The Year 6 Choir once again qualified for this National Competition finals – this was the seventh consecutive year that a choir from the school had achieved this. The children met at school on Sunday 11th March, and travelled down to London, staying at a Premier Inn so that they could be as fresh as possible for the exciting day ahead. On the Monday, after a hearty breakfast, they set off to the Royal Festival Hall, full of hope. They managed to watch some of the choirs before it was their turn to go backstage for the warm up. 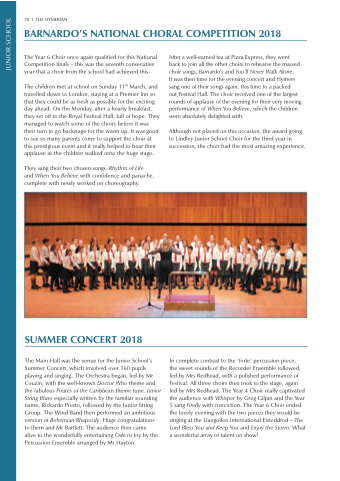 It was good to see so many parents come to support the choir at this prestigious event and it really helped to hear their applause as the children walked onto the huge stage. They sang their two chosen songs, Rhythm of Life and When You Believe with confidence and panache, complete with newly worked on choreography. After a well-earned tea at Pizza Express, they went back to join all the other choirs to rehearse the massed choir songs, Barnardo’s and You’ll Never Walk Alone. out Festival Hall. The choir received one of the largest rounds of applause of the evening for their very moving performance of When You Believe, which the children were absolutely delighted with. Although not placed on this occasion, the award going to Lindley Junior School Choir for the third year in succession, the choir had the most amazing experience. to them and Mr Bartlett. The audience then came alive to the wonderfully entertaining Ode to Joy by the Percussion Ensemble arranged by Mr Hayton. the sweet sounds of the Recorder Ensemble followed, led by Mrs Redhead, with a polished performance of Festival. All three choirs then took to the stage, again led by Mrs Redhead. The Year 4 Choir really captivated the audience with Whisper by Greg Gilpin and the Year 5 sang Firefly with conviction. The Year 6 Choir ended the lovely evening with the two pieces they would be singing at the Llangollen International Eisteddfod – The Lord Bless You and Keep You and Enjoy the Storm. What a wonderful array of talent on show!